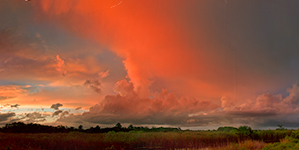 This 180-degree panoramic photograph was taken just west of the Shark Valley entrance to Everglades National Park (about 40 miles west of Miami on Tamiami Trail (US-41)). It shows the landscape from west, through north, to east. It was a typical summer/rainy season day with plenty of thunderstorms and we had been at this spot all afternoon trying to photograph lightning strikes or dramatic storm clouds. Most of the lightning activity had been too far off. The sun had finally set and the light was fading fast, and the mosquitos in the Everglades in the summer are legendary, so we started packing up as fast as we could. Just as we were about to leave, a hole opened up in the clouds on the western horizon leaving this magnificent view. Quickly, we pulled our gear back out of the back of the van, got the tripod out of its bag, set up and leveled, put the camera on the tripod and started composing the shots. The scene only lasted about ten minutes. 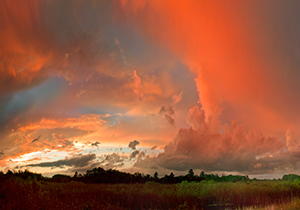 It took four photographs stitched together to capture that wide of a view. When the light first broke through the clouds there was a rainbow on the right side, but we weren't fast enough to capture it. We won't quibble; we are happy with what we captured (although occasionally Nancy likes to remind God that he owes her a rainbow). 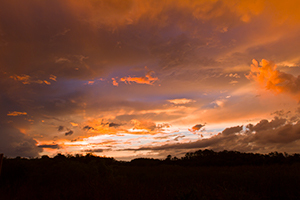 Rain in the summer wet season is crucial to maintain the life cycle of the everglades. “God’s Artistry” received praise in November. Photographic details: Canon EOS 7D camera w/ EF 16-35mm f/2.8L USM lens set at 16mm. Camera was set on Shutter Priority and had apertures starting at f/22 and rapidly going to f/10 for 1/2 sec at ISO 200. Fine Art Paper N/A 19" x 62"
Canvas 18" x 60" 25" x 83"
To adapt the extreme aspect ratio of this image to our other products, we've had to make some adjustments. Notecards: we used about 48% of the scene, horizontally, compressed about 9%. Matted "5x7" prints: are actually 4" x 8" for this image and use about 60% of the scene, horizontally, uncompressed. 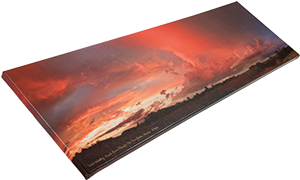 Matted 10"x15" print: was actually a separate image, titled "Stormy Sunset", taken just three minutes before the full composite image was started. Camera was again in shutter priority (f/22) resulting in 1/5 sec at ISO 200.